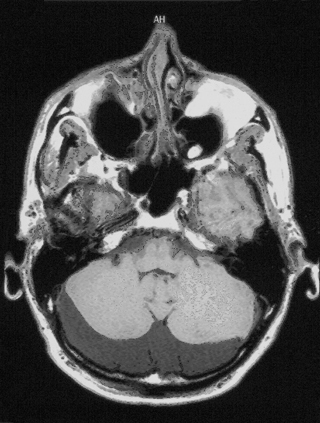 Periodic alternating nystagmus in person who had a previous hemmorage into nodulus of cerebellum. PAN is a persistant horizontal jerk nystagmus that periodically changes direction. PAN can be divided into congential and acquired. Acquired PAN is of the most interest. The acquired type is further subdivided into those due to cerebellar problems, visual problems, and idiopathic. One of the PAN movies on the site-DVD shows a person with strong acquired PAN, with a long period (about 4 minutes), of uncertain cause (idiopathic). An example of strong acquired PAN is shown in the figure above. This person acquired PAN through a stroke to the cerebellum. Acquired PAN has been mainly reported in cerebellar disorders. Cerebellar disorders associated with PAN include arachnoid cyst of the posterior fossa (Towle and Romanul 1970) , Arnold-Chiari malformation (Meienberg and Hoyt 1980) , spinocerebellar degeneration (Plant 1982; Stell, Bronstein et al. 1989; Yabe, Sasaki et al. 1998; Yabe, Sasaki et al. 1998) , focal cerebellar lesions associated with multiple sclerosis (Keane 1974) , and cystacercosis (Keane 1993) . PAN can occur as a side effect of anticonvulsant medication (Campbell 1980) , presumably also related to cerebellar dysfunction. There is substantial evidence that PAN can be the result of damage to the cerebellar uvula and nodulus. For example, PAN can be induced in monkeys by lesions of nodulus (Waespe, Cohen et al. 1985; Wearne, Raphan et al. 1998) . In humans, while many reports of PAN are associated with diffuse cerebellar lesions, some have been associated with small specific lesions of the nodulus. Kennard et. al. reported a case of PAN in a patient with cerebellar medulloblastoma, which is a tumor that arises in the cerebellar nodulus (Kennard, Barger et al. 1981). In our case (Chiu and Hain, 2002), we hypothesized that the nodulus or uvula might have been damaged early in life, thus resulting in an enlarged cisterna magna and a tendency towards PAN. Recently it has been reported that PAN can be provoked by lithium (Lee and Lessell, 2003). This is unsurprising as lithium toxicity can induce other types of central nystagmus and is also a cerebellar toxin. It seems likely that other disorders that affect vision or cerebellar function may also be associated with PAN in the future. PAN can also be associated with visual disturbances such as cataract, which can clear after surgery with vision improvement (Cross, Smith et al. 1982; Jay, Williams et al. 1985) . This suggests that PAN can be a transient consequence of sensory impairment. Theoretical analyses of PAN postulate that it is related to loss of central inhibition of vestibular circuitry (Leigh, Robinson et al. 1981; Furman, Hain et al. 1989; Furman, Wall et al. 1990) . These models have triggered PAN with vestibular signals. In our patient, we hypothesize that a Meniere's attack may have provided the trigger for PAN in a similar fashion as visual loss may also induce PAN. Congenital PAN is mainly found in albinism (Guyer and Lessell 1986; Abadi and Pascal 1994). A movie of congenital PAN can be accessed here. This nystagmus has the increasing-velocity expoential, and also often is much more rapid to change direction than the acquired PAN. The author has observed that some normal persons appear to have minor amounts of PAN. In order to record this, one must use a sensitive method (i.e. IR) and record for several minutes. There are several reports of PAN occuring in individuals with Meniere's disease, e.g. Murofushi et al, 2008 and Chiu and Hain, 2002. We think that these are all individuals with cerebellar disturbances and Meniere's together. We do not think there is truly a "peripheral" PAN. Otherwise, one would need to rethink the definition of Meniere's and include disorders that are outside of the inner ear. Both congenital and acquired PAN can often be abolished by treatment with Baclofen (Halmagyi, Rudge et al. 1980; Troost, Janton et al. 1990) . PAN CASE REPORT (Chiu, 2002). A 51 year-old Caucasian male with a history of decreased hearing in left ear and recurrent vertigo over 10 years attributed to Meniere's disease presented to our hospital for two drop attacks. The drop attacks were not associated with headache, dizziness, vertigo, loss of consciousness, confusion, visual changes, nausea, vomiting, or chest pain, and they were attributed to the "otolithic crises of Tumarkin", which are found in advanced Meniere's disease . While in the hospital, he developed an episode of vertigo with nausea and vomiting. His eyes at that time also showed strong horizontal nystagmus which were reported one reliable observers as being left beating, and by another as being right beating. Electronystagmography showed an alternating right and left beating nystagmus with a periodicity of approximately 50 seconds consistent with PAN. Clinical exam at that time using Frenzel's goggles also documented PAN. He was treated with baclofen. The nystagmus abated, and on repeat exam using Frenzel's goggles 1 month later, it was not evident. Figure 2: MRI of case of PAN showing enlarged cisterna magna. As shown in figure 2, a magnetic resonance scan (MRI) of the brain without contrast demonstrated an enlarged cisterna magna associated with mild hypoplasia of right cerebellar hemisphere. A subsequent cisternogram demonstrated communication of the enlarged posterior fossa space with cerebral spinal fluid, documenting that the apparently enlarged cisterna magna was not a subarachnoid cyst. This clinical report illustrates that the finding of an enlarged cisterna magna can be associated with a pathological abnormality, namely PAN. It further suggests that in susceptible individuals, PAN may be transiently induced by vestibular imbalance. Abadi, R. V. and E. Pascal (1994). "Periodic alternating nystagmus in humans with albinism." Invest Ophthalmol Vis Sci35(12): 4080-6. Campbell, W. W., Jr. (1980). "Periodic alternating nystagmus in phenytoin intoxication." Arch Neurol37(3): 178-80. Cross, S. A., J. L. Smith and E. W. Norton (1982). "Periodic alternating nystagmus clearing after vitrectomy." J Clin Neuroophthalmol2(1): 5-11. DiBartolomeo, J. R. and R. D. Yee (1988). "Periodic alternating nystagmus." Otolaryngol Head Neck Surg99(6): 552-7. Furman, J. M., T. C. Hain and G. D. Paige (1989). "Central adaptation models of the vestibulo-ocular and optokinetic systems." Biol Cybern61(4): 255-64. Furman, J. M., C. d. Wall and D. L. Pang (1990). "Vestibular function in periodic alternating nystagmus." Brain113(Pt 5): 1425-39. Guyer, D. R. and S. Lessell (1986). "Periodic alternating nystagmus associated with albinism." J Clin Neuroophthalmol 6(2): 82-5. Halmagyi, G. M., P. Rudge, M. A. Gresty, et al. (1980). "Treatment of periodic alternating nystagmus." Ann Neurol8(6): 609-11. Jay, W. M., B. B. Williams and A. De Chicchis (1985). "Periodic alternating nystagmus clearing after cataract surgery." J Clin Neuroophthalmol5(3): 149-52. Keane, J. R. (1974). "Periodic alternating nystagmus with downward beating nystagmus. A clinicoanatomical case study of multiple sclerosis." Arch Neurol30(5): 399-402. Keane, J. R. (1993). "Cysticercosis: unusual neuro-ophthalmologic signs." J Clin Neuroophthalmol13(3): 194-9. Kennard, C., G. Barger and W. F. Hoyt (1981). "The association of periodic alternating nystagmus with periodic alternating gaze. A case report." J Clin Neuroophthalmol1(3): 191-3. Leigh, R. J., D. A. Robinson and D. S. Zee (1981). "A hypothetical explanation for periodic alternating nystagmus: instability in the optokinetic-vestibular system." Ann N Y Acad Sci374: 619-35. Lusins, J. O. and H. Nakagawa (1981). "Degenerative disorders of the cerebellum studied by computerized tomography." J Comput Tomogr5(1): 25-32. Meienberg, O. and W. F. Hoyt (1980). "Ocular motor control disorder during the neutral phase of periodic alternating nystagmus." J Neurol 223(4): 309-12. Plant, G. T. (1982). "Periodic alternating nystagmus in a case of hereditary ataxia and its treatment with baclofen [letter]." J Neurol Neurosurg Psychiatry45(12): 1170-1. Stell, R., A. M. Bronstein, G. T. Plant, et al. (1989). "Ataxia telangiectasia: a reappraisal of the ocular motor features and their value in the diagnosis of atypical cases." Mov Disord4(4): 320-9. Towle, P. A. and F. Romanul (1970). "Periodic alternating nystagmus: first pathologically studied case." Neurology20(4): 408. Troost, B. T., F. Janton and R. Weaver (1990). "Periodic alternating oscillopsia: a symptom of alternating nystagmus abolished by baclofen." J Clin Neuroophthalmol10(4): 273-7. Waespe, W., B. Cohen and T. Raphan (1985). "Dynamic modification of the vestibulo-ocular reflex by the nodulus and uvula." Science228(4696): 199-202. Wearne, S., T. Raphan and B. Cohen (1998). "Control of spatial orientation of the angular vestibuloocular reflex by the nodulus and uvula." J Neurophysiol79(5): 2690-715. Yabe, I., H. Sasaki, I. Yamashita, et al. (1998). "[Periodic alternating nystagmus in spinocerebellar ataxia type 6 (SCA 6)]." Rinsho Shinkeigaku38(6): 512-5. Yabe, I., H. Sasaki, I. Yamashita, et al. (1998). "[Initial symptoms and mode of neurological progression in spinocerebellar ataxia type 6 (SCA6)]." Rinsho Shinkeigaku 38(6): 489-94.